For other uses, see Saints Cyril and Methodius (disambiguation). 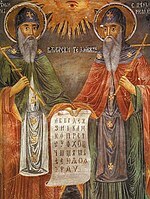 Saints Cyril and Methodius (826–869, 815–885; Greek: Κύριλλος καὶ Μεθόδιος (Kýrillos kaí Methódios), Old Church Slavonic: Кѷриллъ и Меѳодїи[more]) were two brothers who were Byzantine Christian theologians and Christian missionaries. Through their work they influenced the cultural development of all Slavs, for which they received the title "Apostles to the Slavs". They are credited with devising the Glagolitic alphabet, the first alphabet used to transcribe Old Church Slavonic. After their deaths, their pupils continued their missionary work among other Slavs. Both brothers are venerated in the Orthodox Church as saints with the title of "equal-to-apostles". In 1880, Pope Leo XIII introduced their feast into the calendar of the Roman Catholic Church. In 1980, Pope John Paul II declared them co-patron saints of Europe, together with Benedict of Nursia. brothers depicted together; Eastern bishops holding up a church; Eastern bishops holding an icon of the Last Judgment. Often, Cyril is depicted wearing a monastic habit and Methodius vested as a bishop with omophorion. The two brothers were born in Thessalonica, in present-day Greece – Cyril in about 827–828 and Methodius about 815–820. Cyril was reputedly the youngest of seven brothers; he was born Constantine, but was given the name Cyril upon becoming a monk in Rome shortly before his death, according to the Vita Cyrilli ("The Life of Cyril"). Methodius was born Michael and was given the name Methodius upon becoming a monk at Mysian Olympus (present-day Uludağ), in northwest Turkey. Their father was Leo, a droungarios of the Byzantine theme of Thessalonica, and their mother was Maria. The exact ethnic origins of the brothers are unknown, there is controversy as to whether Cyril and Methodius were of Slavic or Byzantine Greek origin, or both. The two brothers lost their father when Cyril was fourteen, and the powerful minister Theoktistos, who was logothetes tou dromou, one of the chief ministers of the Empire, became their protector. He was also responsible, along with the regent Bardas, for initiating a far-reaching educational program within the Empire which culminated in the establishment of the University of Magnaura, where Cyril was to teach. Cyril was ordained as priest some time after his education, while his brother Methodius remained a deacon until 867/868. About the year 860, Byzantine Emperor Michael III and the Patriarch of Constantinople Photius (a professor of Cyril's at the University and his guiding light in earlier years), sent Cyril on a missionary expedition to the Khazars who had requested a scholar be sent to them who could converse with both Jews and Saracens. It has been claimed that Methodius accompanied Cyril on the mission to the Khazars, but this may be a later invention. The account of his life presented in the Latin "Legenda" claims that he learned the Khazar language while in Chersonesos, in Taurica (today Crimea). The brothers wrote the first Slavic Civil Code, which was used in Great Moravia. The language derived from Old Church Slavonic, known as Church Slavonic, is still used in liturgy by several Orthodox Churches and also in some Eastern Catholic churches. The mission of Constanine and Methodius had great success among Slavs in part because they used the people's native language rather than Latin or Greek. In Great Moravia, Constantine and Methodius also encountered missionaries from East Francia, representing the western or Latin branch of the Church, and more particularly representing the Carolingian Empire as founded by Charlemagne, and committed to linguistic, and cultural uniformity. They insisted on the use of the Latin liturgy, and they regarded Moravia and the Slavic peoples as part of their rightful mission field. When friction developed, the brothers, unwilling to be a cause of dissension among Christians, decided to travel to Rome to see the Pope, and seek a solution that would avoid quarreling between missionaries in the field. In 867, Pope Nicholas I (858-867) invited the brothers to Rome. Their evangelizing mission in Moravia had by this time become the focus of a dispute with Archbishop Adalwin of Salzburg (859–873) and Bishop Ermanrich of Passau (866-874), who claimed ecclesiastical control of the same territory and wished to see it use the Latin liturgy exclusively. Travelling with the relics of Saint Clement and a retinue of disciples, and passing through Pannonia (the Balaton Principality), where they were well received by Prince Koceľ. This activity in Pannonia made a continuation of conflicts inevitable with the German episcopate, and especially with the bishop of Salzburg, to whose jurisdiction Pannonia had belonged for seventy-five years. As early as 865, Bishop Adalwin was found to exercise Episcopal rights there, and the administration under him was in the hands of the archpriest Riehbald. The latter was obliged to retire to Salzburg, but his superior was naturally disinclined to abandon his claims. The brothers sought support from Rome, and arrived there in 868, where they were warmly received. This was partly due to their bringing with them the relics of Saint Clement; the rivalry with Constantinople as to the jurisdiction over the territory of the Slavs would incline Rome to value the brothers and their influence. New Pope Adrian II (867-872) gave Methodius the title of Archbishop of Sirmium (now Sremska Mitrovica in Serbia) and sent him back in 869, with jurisdiction over all of Moravia and Pannonia, and authorisation to use the Slavonic Liturgy. The brothers were praised for their learning and cultivated for their influence in Constantinople. Anastasius Bibliothecarius would later call Cyril "a man of apostolic life" and "a man of great wisdom". Their project in Moravia found support from Pope Adrian II, who formally authorized the use of the new Slavic liturgy. Subsequently Methodius was ordained as priest by the pope himself, and five Slavic disciples were ordained as priests (Saint Gorazd, Saint Clement of Ohrid and Saint Naum) and as deacons (Saint Angelar and Saint Sava) by the prominent bishops Formosus and Gauderic. Cyril and Methodius along with these five disciples are collectively venerated (mainly by the Bulgarian Orthodox Church) as "Seven Saints". The newly made priests officiated in their own languages at the altars of some of the principal churches. Feeling his end approaching, Cyril became a Basilian monk, was given the new name Cyril, and died in Rome fifty days later (14 February 869). There is some question as to assertion of the Translatio (ix.) that he was made a bishop. The statement of the "Vita" that Methodius was made bishop in 870 and not raised to the dignity of an archbishop until 873 is contradicted by the brief of Pope John VIII, written in June 879, according to which Adrian consecrated him archbishop; John includes in his jurisdiction not only Great Moravia and Pannonia, but Serbia as well. Methodius now continued the work among the Slavs alone; not at first in Great Moravia, but in Pannonia (in the Balaton Principality), owing to the political circumstances of the former country, where Rastislav had been taken captive by his nephew Svatopluk in 870, then delivered over to Carloman of Bavaria, and condemned in a diet held at Regensburg at the end of 870. A the same time, the East Frankish rulers and their bishops decided to remove Methodius. The archiepiscopal claims of Methodius were considered such an injury to the rights of Salzburg that he was captured and forced to answer to East Frankish bishops: Adalwin of Salzburg, Ermanrich of Passau, and Anno of Freising. After a heated discussion, they declared the deposition of the intruder, and ordered him to be sent to Germany, where he was kept prisoner in a monastery for two and a half years. In spite of the strong representations of the Conversio Bagoariorum et Carantanorum, written in 871 to influence the pope, though not avowing this purpose, Rome declared emphatically for Methodius, and sent a bishop, Paul of Ancona, to reinstate him and punish his enemies, after which both parties were commanded to appear in Rome with the legate. Thus in 873, new Pope John VIII (872-882) secured the release of Methodius, but instructed him to stop using the Slavonic Liturgy. In 878, Methodius was summoned to Rome on charges of heresy and using Slavonic. This time Pope John was convinced by the arguments that Methodius made in his defence and sent him back cleared of all charges, and with permission to use Slavonic. The Carolingian bishop who succeeded him, Witching, suppressed the Slavonic Liturgy and forced the followers of Methodius into exile. Many found refuge with Knyaz Boris of Bulgaria, under whom they reorganised a Slavic-speaking Church. Meanwhile, Pope John's successors adopted a Latin-only policy which lasted for centuries. It was not until after Methodius' death, which is placed on 6 April 885, that the animosity erupted into an open conflict. Gorazd, whom Methodius had designated as his successor, was not recognised by Pope Stephen V. The same Pope forbade the use of the Slavic liturgy and placed the infamous Wiching as Methodius' successor. The latter exiled the disciples of the two brothers from Great Moravia in 885. They fled to the First Bulgarian Empire, where they were welcomed and commissioned to establish theological schools. There they and scholar Saint Clement of Ohrid devised the Cyrillic script on the basis of the Glagolitic. Cyrillic gradually replaced Glagolitic as the alphabet of the Old Church Slavonic language, which became the official language of the Bulgarian Empire and later spread to the Eastern Slav lands of Kievan Rus'. Cyrillic eventually spread throughout most of the Slavic world to become the standard alphabet in the Eastern Orthodox Slavic countries. Hence, Cyril and Methodius' efforts also paved the way for the spread of Christianity throughout Eastern Europe. Methodius' body was buried in the main cathedral church of Great Moravia. Until today it remains an open question which city was capital of Great Moravia and therefore the place of Methodius' eternal rest remains unknown. A cartoon about Saints Cyril and Methodius from Bulgaria in 1938. The caption reads : Brother Cyril, go tell those who are inside to learn the alphabet so they know freedom (Bulgarian: свобода) and eradication (Bulgarian: слободия) are not the same. The early Cyrillic alphabet was developed in the First Bulgarian Empire and later finalized and spread by disciples Kliment and Naum in the Ohrid and Preslav schools of Tsar Boris I of Bulgaria as a simplification of the Glagolitic alphabet which more closely resembled the Greek alphabet. It was developed by the disciples of Saints Cyril and Methodius at the Preslav Literary School at the end of the 9th century. In Bulgaria it is celebrated on 24 May and is known as the "Bulgarian Education and Culture, and Slavonic Script Day" (Bulgarian: Ден на българската просвета и култура и на славянската писменост), a national holiday celebrating Bulgarian culture and literature as well as the alphabet. It is also known as "Alphabet, Culture, and Education Day" (Bulgarian: Ден на азбуката, културата и просвещението). Saints Cyril and Methodius are patrons of the National Library of Bulgaria. There is a monument to them in front of the library. Saints Cyril and Methodius are the most celebrated saints in the Bulgarian Orthodox church, and icons of the two brothers can be found in every church. In the Republic of Macedonia, it is celebrated on 24 May and is known as the "Saints Cyril and Methodius, Slavonic Enlighteners' Day" (Macedonian: Св. Кирил и Методиј, Ден на словенските просветители), a national holiday. The Government of the Republic of Macedonia enacted a statute of the national holiday in October 2006 and the Parliament of the Republic of Macedonia passed a corresponding law at the beginning of 2007. Previously it had only been celebrated in the schools. It is also known as the day of the "Solun Brothers" (Macedonian: Солунските браќа). In the Czech Republic and Slovakia, the two brothers were originally commemorated on 9 March, but Pope Pius IX changed this date to 5 July for several reasons. Today, Saints Cyril and Methodius are revered there as national saints and their name day (5 July), "Sts Cyril and Methodius Day" is a national holiday in Czech Republic and Slovakia. In the Czech Republic it is celebrated as "Slavic Missionaries Cyril and Methodius Day" (Czech: Den slovanských věrozvěstů Cyrila a Metoděje); in Slovakia it is celebrated as "St. Cyril and Metod Day" (Slovak: Sviatok svätého Cyrila a Metoda). In Russia, it is celebrated on 24 May and is known as the "Slavonic Literature and Culture Day" (Russian: День славянской письменности и культуры), celebrating Slavonic culture and literature as well as the alphabet. Its celebration is ecclesiastical (11 May in the Church's Julian calendar). It is not a public holiday in Russia. The saints' feast day is celebrated by the Eastern Orthodox Church on 11 May and by the Roman Catholic Church and the Anglican Communion on 14 February as "Saints Cyril and Methodius Day". The Lutheran Churches of Western Christianity commemorate the two saints either on 14 February or 11 May. The Byzantine Rite Lutheran Churches celebrate Saints Cyril and Methodius Day on 24 May. ^ a b Jones, Terry. "Methodius". Patron Saints Index. Archived from the original on 19 February 2007. Retrieved 18 February 2007. ^ "(PDF) Figures of (trans-) national religious memory of the Orthodox southern Slavs before 1945: an outline on the examples of SS. Cyril and Methodius". ResearchGate. Retrieved 15 November 2018. ^ "SS.Cyril and Methodius". www.carpatho-rusyn.org. Archived from the original on 17 March 2016. Retrieved 2 May 2018. 15. William Leslie King. Investment and Achievement: A Study in Christian Progress. Jennings and Graham, 1913. Columbia University. Hastings, Adrian (1997). The construction of nationhood: ethnicity, religion, and nationalism. Cambridge: Cambridge University Press. p. 126. ISBN 0-521-62544-0. The activity of the brothers Constantine (later renamed Cyril) and Methodius, aristocratic Greek priests who were sent from Constantinople. Fletcher, R. A. (1999). The barbarian conversion: from paganism to Christianity. Berkeley, California: University of California Press. p. 327. ISBN 0-520-21859-0. Cizevskij, Dmitrij; Zenkovsky, Serge A.; Porter, Richard E. Comparative History of Slavic Literatures. Vanderbilt University Press. pp. vi. ISBN 0-8265-1371-9. Two Greek brothers from Salonika, Constantine who later became a monk and took the name Cyril and Methodius. Smalley, William Allen (1991). Translation as mission: Bible translation in the modern missionary movement. Macon, Ga.: Mercer. p. 25. ISBN 978-0-86554-389-8. The most important instance where translation and the beginning church did coincide closely was in Slavonic under the brothers Cyril and Methodius, with the Bible completed by A.D. 880. This was a missionary translation but unusual again (from a modern point of view) because not a translation into the dialect spoken where the missionaries were. The brothers were Greeks who had been brought up in Macedonia. ^ The Lives of the Ninth-Century Popes (Liber Pontificalis)– Google Knihy. Books.google.cz. 1 January 1995. ISBN 0-85323-479-5. Retrieved 24 December 2015. ^ "Pope Benedict XVI. "Saints Cyril and Methodius", General Audience 17 June 2009, Libreria Editrice Vaticana". W2.vatican.va. Retrieved 29 January 2019. ^ "From Eastern Roman to Byzantine: transformation of Roman culture (500-800)". Indiana University Northwest. Archived from the original on 16 September 2017. Retrieved 31 August 2017. ^ "Sts. Cyril and Methodius". Pravmir. Archived from the original on 7 March 2012. Retrieved 31 August 2017. ^ "Sv. Gorazd a spoločníci" [St. Gorazd and his colleagues]. Franciscan Friars of Slovakia (in Slovak). Archived from the original on 24 September 2015. Retrieved 27 August 2015. ^ "Seven Saints". Kashtite.com. 27 July 2016. Retrieved 29 January 2019. ^ As is customary, when one becomes a monk in the Eastern Orthodox tradition, one receives a new name. ^ Bowlus 1995, p. 165-186. ^ Goldberg 2006, p. 319-320. ^ Richard P. McBrien, Lives of the Popes, (HarperCollins, 2000), 144. ^ "In Pictures: Ohrid, Home of Cyrillic". Balkan Insight. 24 May 2017. Retrieved 29 January 2019. ^ Encyclopædia Britannica, Major alphabets of the world, Cyrillic and Glagolitic alphabets, 2008, O.Ed. "The two early Slavic alphabets, the Cyrillic and the Glagolitic, were invented by St. Cyril, or Constantine (c. 827–869), and St. Methodius (c. 825–884). These men were Greeks from Thessalonica who became apostles to the southern Slavs, whom they converted to Christianity. ^ Paul Cubberley (1996) "The Slavic Alphabets"
^ Daniels and Bright, eds. The World's Writing Systems. Oxford University Press. ISBN 0-19-507993-0. ^ "Nikolaos Martis: MACEDONIA". www.hri.org. Archived from the original on 2 May 2018. Retrieved 2 May 2018. ^ "История на България", Том 6 Българско Възраждане 1856–1878, Издателство на Българската академия на науките, София, 1987, стр. 106 (in Bulgarian; in English: "History of Bulgaria", Volume 6 Bulgarian Revival 1856–1878, Publishing house of the Bulgarian Academy of Sciences, Sofia, 1987, page 106). ^ Jubilee speech of the Academician Ivan Yuhnovski, Head of the Bulgarian Academy of Sciences, held on 23 May 2003, published in Information Bulletin Archived 3 December 2007 at the Wayback Machine of the Bulgarian Academy of Sciences, 3(62), Sofia, 27 June 2003 (in Bulgarian). ^ Announcement about the eleventh session of the Government of the Republic of Macedonia on 24 October 2006 from the official site Archived 10 June 2008 at the Wayback Machine of the Government of the Republic of Macedonia (in Macedonian). ^ a b Votruba, Martin. "Holiday date". Slovak Studies Program. University of Pittsburgh. Archived from the original on 14 May 2011. Retrieved 11 March 2009. ^ "День Св. Кирила та Мефодія, просвітителів слов'янських" (in Ukrainian). Ukrainian Lutheran Church. 24 May 2014. Retrieved 19 September 2018. ^ "The Ljubljana Metropolitan Province". 5 March 2014. Archived from the original on 5 March 2014. ^ "Sisters of Saints Cyril and Methodius". Sscm.org. 4 March 2002. Archived from the original on 23 June 2013. Retrieved 14 June 2013. Herbermann, Charles, ed. (1913). "Sts. Cyril and Methodius" . Catholic Encyclopedia. New York: Robert Appleton Company.